I am the extremely proud owner (renter) of a fire escape. Having lived in both Chicago and Washington D.C., I consider myself well-versed in roofs and stoops – not to mention porches — but I am only just being introduced to the joys of a chipped black F.E. Attached to the fire escape is my one-bedroom apartment, all housed in a three-story brick building that smells like Clorox. The clean smell was the single greatest factor in my decision to move in. I later learned the scent was my neighbor’s cologne, but that’s another story. I first really became acquainted with my fire escape when my patient father, helping me move into the apartment, insisted I install my air conditioning units. I peered out the window to the ten-foot drop below. “Crawl out,” my father said, balancing the air conditioner on his thigh. I put the tip of my index finger over the ledge of the window. I touched the rusting metal strips. I measured the two-inch wide gaps against my knuckles. I leaned back into the room. My father raised his eyebrows. 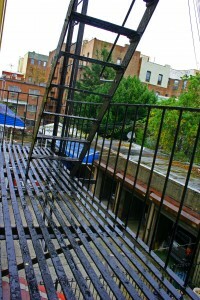 Eventually he convinced me that a fire escape’s only purpose is to not collapse, so I clambered out and looked around. My window looks out on a concrete courtyard where old Greek men clean their cars. I could throw a discus to the back windows of my neighbors Across the Way. But in between are several leafy trees. They aren’t the maples I grew up with, but they’re big and knobbly and strong. They are the kind of trees that would look good with a few names carved in them. My landlord tells me Astoria was put together before the war – I have not asked which – and all its buildings are low-lying. Five-stories is the most you’ll see here, so I have a big view of open sky. After my initial hesitation, my fire escape started to live up to its name. It became my escape. I sit here at night when no one can see me and on Sunday mornings with Martha Stewart’s magazine and some coffee. Today I am on the metal bars, listening to the downstairs girl practice her saxophone and admiring the way even the city smells good after it rains. 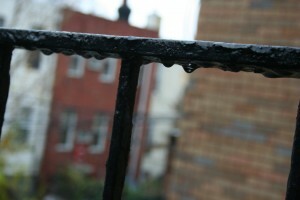 Between the slats, I can see a puddle on the ground below. Three tawny birds are splashing in the water. Birds need very little water to get clean. Someone should make a commercial about how eco-friendly they are. There is something relaxing, in a private way, about sitting on a fire escape. It differs from a stoop or a porch. It is the only place to be alone outside in New York. And mine hasn’t collapsed yet. Everyone from E.B. White to Carrie Bradshaw has had their crack at capturing the quintessential New York moment. If you stay longer than a few days, you’ll have one. People collect them. Like balls of lint. I had one just yesterday. After a brief but broiling summer, autumn has begun its chilly descent on the city Inch by begrudging inch, young professionals are covering up. There are pomegranates in my grocery store. And even though there are still girls tanning in the parks, you can see they have goosebumps. I took a walk in Astoria Park, which abuts the tidal waters of the Hudson. I strolled hither and thither and was enjoying some laps on the park’s rubber track when I heard it. The unmistakable sounds of a small boombox filling a big space. Tinny. Brassy. Loud. I paused from my grim circling of the track – always feeling like a vulture honing in on my healthier self – and saw three teenagers spreading a tarp. They were wearing identical blue cotton pants and matching shirts – none. One was bald, one had a ringlet rattail, and one had a mohawk. Larry, Curly and Mo writ modern. I sat on the grass, the first member of their audience. They swiveled on their shoulderblades, twirled on their heads (and toes), kicked their heels up. They practiced freezes (where a dancer suddenly stops moving and holds a difficult position for a few seconds before “spinning out” of it). Mostly they perfected their tough-guy faces. While the older guys drank Gatorade, Macauley sidled up to the tarp. He looked at the teenage men, all of whom ignored him. Then he put his toe on the mat. He twirled around once. Twice. Then he began his own freestyle dance. He did flips, kip ups, freezes. He popped his lock and then broke back into the damn building. Before long, the older guys were propping him up and clapping for him and generally being perfect candidates for a commercial on mentoring. I felt it was a beautiful New York moment. It was so urban. Three teenagers playing street music in a park. Suddenly, a little kid wants to participate. And instead of snubbing him or ignoring him, they include him. I felt I might be witnessing the beginning of Macauley’s future. The yellow fall light and breeze from the water made everything feel cinematic. I left the park smiling. I recounted the tale to a friend later, explaining it in detail and how special it felt and trying to do justice to the humanity of it all. Copyright © 2019 Molly Seltzer. All rights reserved.